Wilhelm van der Sluys play for Exeter at the moment. Photo: Getty Images. Wilhelm van der Sluys is indeed joining, but he’s not going to play much with the much trumpeted Stephan Lewies. Lions coach Swys de Bruin has confirmed that the franchise has strengthened its depth at lock with the acquisition of Wilhelm van der Sluys. 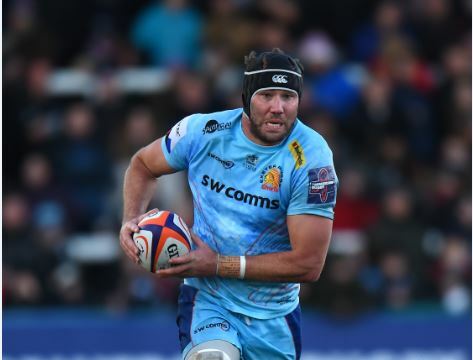 The 27-year-old joins from English giants Exeter Chiefs and provides much-needed experience in the absence of Franco Mostert and Andries Ferreira. “We had to strengthen our depth in the lock department,” said De Bruin. However, the side shouldn’t be lulled into the false sense of security because it, rather surprisingly, turns out Van der Sluys is merely going to replace Stephan Lewies, who was signed on loan from the Sharks at the end of last season. Yet that loan isn’t for an extended period of time. “One must remember that somebody like Stephan Lewies only signed with us for two months, after which he will go to England,” said De Bruin. Lewies is slated to join Harlequins. Van der Sluys will join the Lions only on March 1 – a day before their first home game against the Bulls – so at best he would probably only come into the selection fray for their fourth game against the Jaguares at Ellis Park on March 9. Meanwhile, the Lions could hardly have asked for a tougher challenge to open their Super Rugby campaign than an away game against the Jaguares in Buenos Aires this weekend. In line with their travel arrangements over the last few years, the team were set to depart on Wednesday in an attempt to counter the challenges created by travelling and jet lag. Although the Jaguares are perennial slow starters, they had seven straight wins last year before losing 40-23 to the Lions in their quarterfinal at Ellis Park. “They are a team loaded with international players and have built a proud record at home where they are extremely tough to beat,” said De Bruin, who was expected to name his squad for the trip on Tuesday afternoon. The Lions have not won on the Jaguares’ home turf for the last three years, and while their second game is also away to the Stormers before their first home fixture against the Bulls, De Bruin stressed their opening clash was all that counted for now. “All teams are looking at their campaigns in phases, but while you can plan ahead you can’t really look too far ahead, so our focus is on this weekend,” he said.